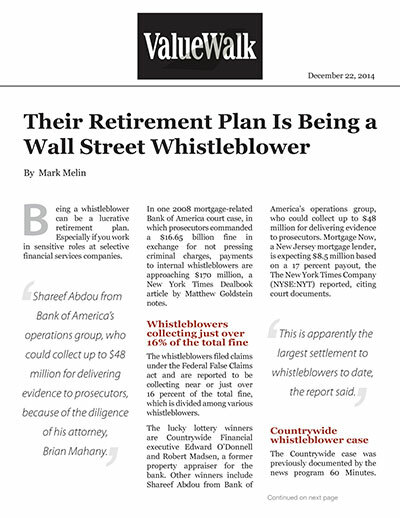 Being a whistleblower can be a lucrative retirement plan. Especially if you work in sensitive roles at selective financial services companies. In one 2008 mortgage-related Bank of America court case, in which prosecutors commanded a $16.65 billion fine in exchange for not pressing criminal charges, payments to internal whistleblowers are approaching $170 million, a New York Times Dealbook article by Matthew Goldstein notes. The whistleblowers filed claims under the Federal False Claims act and are reported to be collecting near or just over 16 percent of the total fine, which is divided among various whistleblowers. The lucky lottery winners are Countrywide Financial executive Edward O’Donnell and Robert Madsen, a former property appraiser for the bank. Other winners include Shareef Abdou from Bank of America’s operations group, who could collect up to $48 million for delivering evidence to prosecutors. Mortgage Now, a New Jersey mortgage lender, is expecting $8.5 million based on a 17 percent payout, the The New York Times Company (NYSE:NYT) reported, citing court documents. The Countrywide case was previously documented by the news program 60 Minutes. Initially the Department of Justice criminal division failed to request interviews with key people inside the bank who had fraud investigations. The official in charge of this investigation, Lanny Breuer, at the time head of DoJ’s criminal division, would later resign shortly after a Frontline PBS documentary titled “The Untouchables” had Brewer admit on camera he would not investigate institutions too big to fail, specifically large banks and their executives, for criminal wrongdoing for fear of the financial damage this would cause the banks. Since then, criminal probes have been launched into the banks and their stock prices have generally risen. This is apparently the largest settlements to whistleblowers to date, the report said. The whistleblower settlements were first referenced in the $16.65 billion civil settlement agreement between the Justice Department and Bank of America, but most details were withheld except for that which was released by mistake. Mortgage Now’s name, however, appeared in one of the settlement papers by accident, the Times reported. The combined $169 million in whistle-blower payouts would make it one of the larger settlements the federal government has agreed to in any single case and may prove an effective deterrent to financial crime. That remains to be seen.